Whether you’re looking to have drinks at a cool bar, dance at a nightclub or sample craft beers at a brewery, Niagara Falls has a ton of amazing nighttime destinations that will make any night out in the city an unforgettable one. 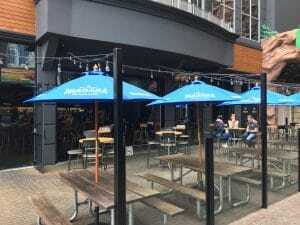 This new craft brewery located on Clifton Hill is a great place to sit back and enjoy a wide range of innovative craft brews and delicious food like warm soft pretzels and homemade meatball sandwiches. Beers currently on tap include Niagara Premium Lager, Beerdevil IPA, Honeymoon Peach Radler, Amber Eh! Ale, Clockwork Berliner Weisse, Best Bitter, and more. And with daily live entertainment and Hoppy Hour, it’s the perfect place to spend a night with friends. Spicy Olive Bar & Grill is located in the heart of the city’s tourist district at the top of Clifton Hill and is an authentic Italian restaurant that turns into a lively bar at night. The bar features live music from great local bands along with a full-service bar and plenty of seating space. Spicy Olive is close by to many other Niagara Falls destinations and is an ideal spot to grab a quick drink or sit back with friends for the night. Located inside Fallsview Casino Resort on Fallsview Boulevard, Dragonfly is Niagara’s top nightclub destination that hosts a number of exclusive events you won’t want to miss out on. 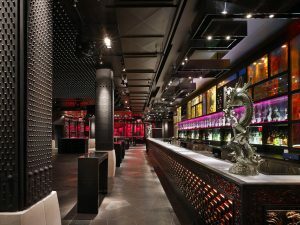 Upcoming events include Dragonfly Fridays and Saturdays featuring great DJs along with guestlist and bottle service options, which is the perfect time to go dancing and experience all that this Asian inspired nightclub has to offer.